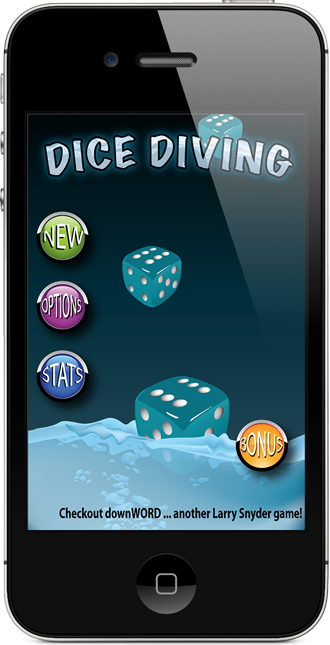 Dice Diving is a new game that combines the excitement of competitive high-diving with the thrill of poker-style hand making. Just as in high-diving, Dice Diving pushes the player to focus both on the degree of difficulty and individual judging of the dive. Using five dice the player is required to complete specific hands that represent the 3 elements of a high-dive difficulty, including the approach, the flight and the entry. At the same time, while trying to complete the difficulty, the player must also complete five free-play hands representing the five different judges. Gameplay is quick and challenging. With a limited number of rolls, players are forced to make critical decisions balancing the pursuit of the best poker hand for the highest judges scores or completing the mandatory elements in the dive's difficulty. By achieving both in 31 separate events, the player will be awarded with bronze, silver or gold medals and if they are good enough, they will stand alone as the world record holder against all of the dice diving community. Sounds easy? Well, it is easy to pick up and play. A single dive event match only takes a couple of minutes to play, but the high speed competition will take time to master. Are you good enough to capture the world record against other players! There’s only one way to find out!